This is the unofficial blog for the Peterborough - Norwich - Lowestoft XL bus service operated by First Group. 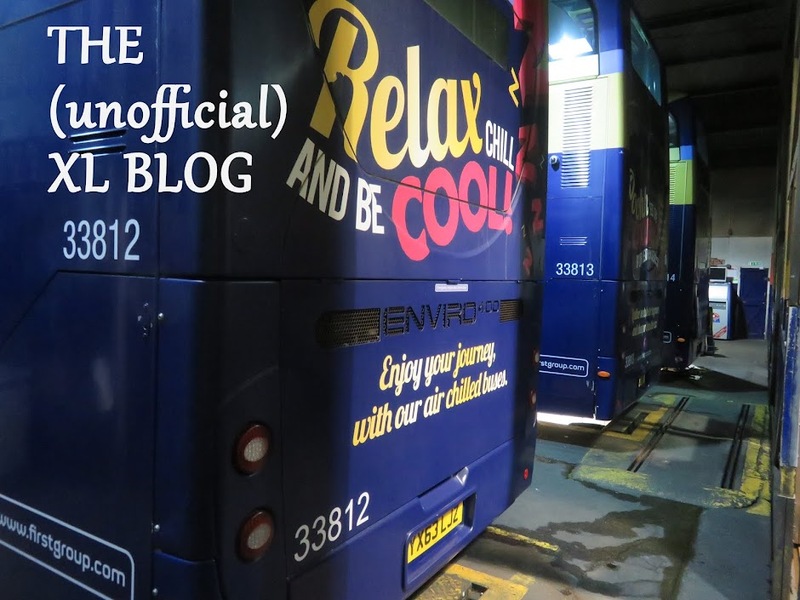 Originally reporting the introduction of the 'Gemini' double deckers and the phasing out of coaches, the blog is now incredibly in its eleventh year and in 2019 we will be monitoring the fleet of 22 Enviro 400 buses which are due for replacement in the coming months. To contact me with your observations/experiences on the XL, email gerardtcc@gmail.com . Anonymity respected. Hello again. It's been a long time. I thought I'd do some monthly updates in 2019 as we approach the time when the current XL fleet of Enviro 400s near the end of their time on the route. Last year 33818 was reallocated to King's Lynn when the new timetable began last February and subsequently, following the loss of 33804 in the accident near Thorney Toll last June, 33819 has also joined the King's Lynn fleet as a replacement. 2019 dawned with a shortage of vehicles as 33817 needed a replacement engine and 33807 had a car run into the back of it just before Christmas and was away at Full Circle for repairs. Norwich helped out by initially loaning Gemini 36180 (the usual replacement under these circumstances). 36180 returned to Norwich on 4th January with a problem and on Saturday 5th 36271 replaced it, working diagram 21 which starts and ends at Norwich. It was running a few minutes late when I saw it on the 16.15 Wisbech - Peterborough probably because of its speed limiter being set at 49mph. On Monday 7th January 36180 returned onto the route and 33817 left King's Lynn for its engine fault. 36180 remained on the XL until 15th, but on 16th 36199 appeared on diagram 21. Next day 36200 was out and this then worked until 21st. No sooner had it been returned following the repairs to 33817 which returned to traffic on 18th and 33807 on 22nd, then 33819 was grounded at Norwich on 24th with a fuel tank problem, so 36200 was back on XLs on 25th and was still deputising on 31st, before 33819 returned on 1st February. MOTs have restarted and 33803 was off the road between 20th & 25th followed by 33814 from 27th to 30th. Next to be prepared for MOT is 33805. Timekeeping has been exceptional since the revamped timetable last year and on the western section, almost everything has run to time except when traffic conditions have dictated otherwise.